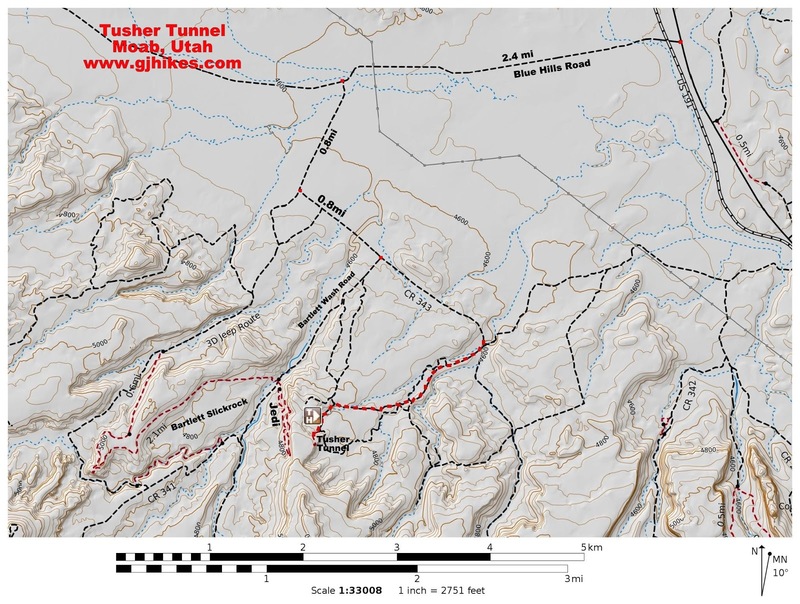 Tusher Tunnel is located in an area managed by the BLM northwest of Moab, Utah off the Mill Canyon Road. The tunnel passes all the way through a sandstone ridge at a length that is probably over 75 feet. It was formed by water seeping through a crack that dissolved away the rock when it reached a harder layer of stone. Visitors can easily walk completely through the tunnel where a little exploring reveals other geologic features that are similar in nature. Those with a high clearance 4-wheel drive vehicle can drive all the way to the Tusher Tunnel trailhead. Others can park along the Mill Canyon Road, as we did, and hike a little less than 2 miles to the trailhead. The sign in the picture is at the intersection of roads where we parked approximately 2.6 miles from Highway 191. Google Maps does a nice job with computing the directions to the trailhead. From the intersection head south into the wash where the road leading to Tusher Tunnel departs immediately to the west. 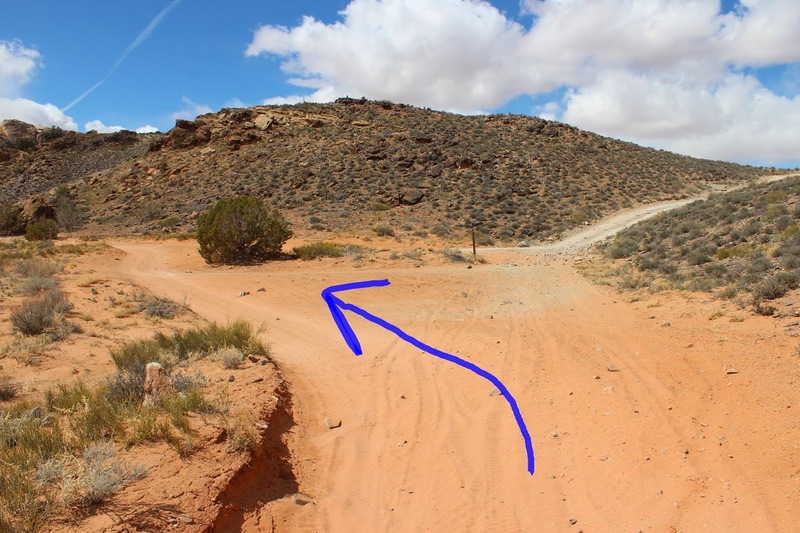 The road base is covered with wind blown sand that gets deep enough in places to make a 4-wheel drive necessary and the hiking a little tough. 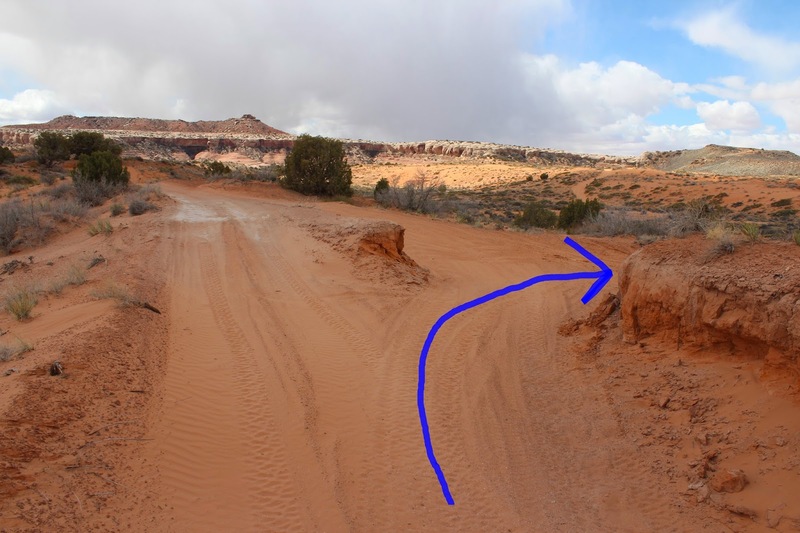 After hiking awhile a road branches off on the right and drops down into the wash. You can turn here or keep hiking a little further where there is another junction. Both of these branches of the road meet up in a short distance. The next intersection is where another route comes in from the Mill Canyon Road. We may have been able to continue down the Mill Canyon Road from where we parked until we got to this point but not knowing anything about the condition of that section of the Mill Canyon Road we decided on the little bit of extra hiking to get to here. The official Tusher Tunnel trailhead is about a quarter mile from the last intersection. The trail makes a minor little scramble to get up to the mouth of the tunnel. The tunnel is long enough, with a little bend in the middle, to make it impossible to see from one portal to the next. A flashlight isn't necessary unless you want to examine the walls for rock art and such. The south end of the tunnel opens up to views of the head of a small canyon. From here you can explore along the cliff in both directions. Just to the right of the tunnels mouth there is a petroglyph on the south facing side of the cliff about 10 feet or so above the ground. There are other petroglyphs in the area also but most are ruined by graffiti. Several other caves and tunnels are along the cliff. They may have been used seasonally as rock shelters by archaic Indians. On our next trip we will check out accessing Tusher Tunnel from a point further down the road. Beginning the hike at this point had its merits as far as seeing a little more of the neighboring landscape. However you find your way to Tusher Tunnel it is well worth the effort. 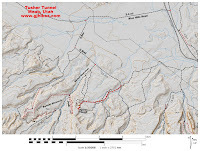 Note: We have recently revisited Tusher Tunnel and it is probably easier to drive in on the Bartlett Wash Road. Follow the directions to the Bartlett Slickrock area but turn at the sign for Tusher Tunnel. If you would like to see it for yourself then all you have to do is 'Take a hike'.